Ultimately, the role of specimen fragmentation in tumor seeding at the port site remains controversial and requires further investigation. Thus, it is likely that the exact method of specimen removal after laparoscopic nephrectomy has little impact on early postoperative morbidity and that both methods are clearly superior to open radical nephrectomy as measured by subjective and objective parameters. Ultimately, the role of specimen fragmentation in tumor seeding at the port site remains controversial and requires further investigation. Morcellation should be performed meticulously and cautiously, and the balance of risks and benefits should be discussed with the patient prior to the operation. It was previously thought that patients undergoing specimen morcellation had reduced pain and more rapid recovery compared to intact removal, and the early experience confirmed this assumption (8). In a cohort of patients undergoing laparoscopic cytore-ductive nephrectomy prior to immunotherapy, the group who had the specimen mor-cellated had reduced postoperative narcotic use, shorter duration of hospitalization, and earlier time to interleukin-2 administration. Subsequent comparisons have not demonstrated a significant difference between intact and morcellated kidney retrieval. The technique of the group from Nagoya, Japan has evolved from transperitoneal laparoscopy with intact extraction to retroperito-neoscopy to the current transperitoneal approach with fractionation. A retrospective analysis suggested that pain and convalescence were similar in the intact (29 mg morphine equivalent and 22.7 days) and fractionated (29 mg and 23.3 days) groups (37). Although it is difficult to compare data between various centers, the reported outcomes of intact specimen removal after retroperitoneal nephrectomy from the Cleveland Clinic compare favorably to all morcellation series, with low analgesic requirements (22 mg morphine equivalent), hospitalization (1.6 days), and convalescent time (4.2 weeks) (3). The mean incision size was 6.7 cm and morbidity was minimized using a muscle-splitting technique. Dunn et al. also retrospectively reviewed patients undergoing laparoscopic radical nephrectomy and nonrandomized selection of intact or morcellated retrieval (38). Intact retrieval (n = 21) was comparable to morcellation (n = 39) in nearly all parameters measured, including hours to ambulation and oral intake, analgesic use, duration of hospitalization, and time to convalescence. The only significant difference was longer operative time in the intact group, likely reflecting the learning curve of laparoscopic nephrectomy because most intact removals were performed early in the series. Gettman et al. prospectively examined the differences between retrieval methods in 12 patients undergoing transperitoneal laparoscopic nephrectomy (39). The two groups were similar with respect to pain and activity scores during the early postoperative period (1-14 days), and time to return to normal activity was not significantly different. The primary difference observed was the incision length (7.6 cm vs. 1.2 cm, p < 0.05). A larger prospective study was reported by Hernandez et al. (40). Although incision length was again shorter in the morcellated group (1.2 cm vs. 7.1 cm intact, p < 0.001), no differences in operative time, narcotic requirement, and length of hospital stay were noted. Thus, it is likely that the exact method of specimen removal after laparoscopic nephrectomy has little impact on early postoperative morbidity and that both methods are clearly superior to open radical nephrectomy as measured by subjective and objective parameters. The inability to perform traditional pathological examination of the morcellated renal specimen has been used to support intact specimen removal (Fig. 2). Several aspects and limitations deserve consideration, including establishing a histologic diagnosis, assessment of surgical margins, and determination of tumor stage. FIGURE 1 m LapSac® (5X8 inches) and an example of laparoscopic introduced FIGURE2 ■ (A) Intact kidney with grossly visible tumor. (B) Appearance of a kidney with mass after laparoscopic nephrectomy and manual morcellation. The morcellated specimen should be processed and examined, in its entirety if necessary, to identify any abnormal renal histopathology. suspected malignancy. Barrett et al. identified no abnormal pathological findings in 3 of 66 morcellated specimens (5%), while Dunn et al. reported one case (3%) without a diagnosis (7,38). The morcellated specimen should be processed and examined, in its entirety if necessary, to identify any abnormal renal histopathology. As illustrated in Figure 2, disruption of the renal architecture creates difficulty in sampling the morcellated specimen. In the intact specimen, only a small portion of the entire specimen requires preparation and examination for diagnosis and staging. Typically, several sections are taken from the mass itself, the margins of resection and renal vein, and any lymph nodes. In contrast, no standard or systematic method of specimen processing and analysis have been established after morcellation. 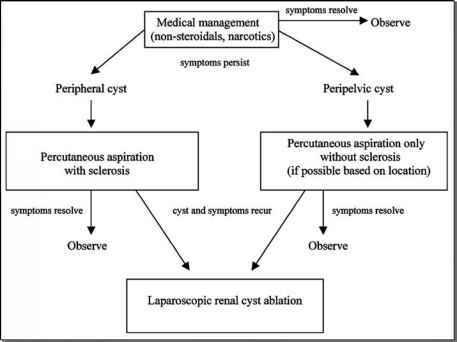 To facilitate pathological analysis, a mathematical model has been proposed to guide the study of morcellated renal specimens. If no grossly abnormal fragments can be selected, a sizeable quantity of tissue is often submitted, but it is not feasible or practical to routinely examine the entire specimen. The basic question is "How much tissue does the pathologist need to prepare and examine for a diagnosis to be made?" Formal probability theory, using the hypergeometric distribution, describes the probability of randomly selecting a portion of desired sample (i.e., tumor) from a total population (i.e., entire specimen) containing a fixed fraction of desired sample (41). Figure 3 illustrates the model for tumors comprising specific fractions of the entire specimen. As expected, examining an increasing percentage of the specimen increases the probability of finding tumor. The model assumes random sampling of the specimen. In some cases, the specimen can be fractionated on the basis of gross appearance, helping focus the search for tumor and decreasing the amount of tissue that needs to be examined. This effectively reduces the total volume of specimen and shifts the sampling curve in Figure 3 to the left. Tables 4 to 6 summarize the data in another fashion, describing the quantity of tissue that must be sampled to ensure a diagnosis at 50%, 75%, and 95% confidence levels. These findings have yet to be validated in prospective studies. Nevertheless, the model provides a framework for both the surgeon and the pathologist with which to approach the pathologic examination of fractionated specimens. Additional factors of time, cost, and manpower will impact the actual protocols at individual institutions. Landman et al. studied the pathologic findings after in vitro electrical morcella-tion of both Formalin-fixed and fresh radical nephrectomy specimens (42). Ten sections from each specimen were submitted for evaluation and provided the pathologic data. Tumor histology, grade, and stage were all evaluable and accurate when compared with analysis of intact tissue in 13 of 14 cases. It was recommended that "multiple sections from the morcellated specimen should be submitted." To improve pathologic diagnosis, Pautler et al. proposed that needle biopsy could be performed after specimen entrapment in a retrieval bag, but prior to morcellation (43). Needle biopsy material, obtained after five passes, yielded congruent diagnoses in 89% of patients; however, morcellated tissue was sufficient for diagnosis in all 15 cases and the needle biopsies did not provide additional information. The relatively large lesions (mean smallest dimension 8.6 cm) likely increased biopsy accuracy of the random sampling, and the utility for smaller lesions remains unclear. In addition, blind needle biopsy raises concern for potential bag perforation. FIGURE 3 ■ Pathologic sampling model based on the hypergeometric distribution. 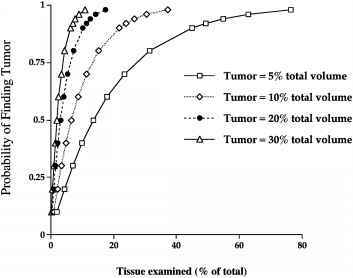 The probability of identifying tumor plotted as a function of amount of tissue sampled for various tumor/total specimen fractions. The over-riding controversy regarding specimen morcellation is the reduced ability to determine tumor stage. Future molecular characterization and stratification of renal tumors, and less dependence on pathologic stage, may predict recurrence or need for secondary treatment and shift preference toward morcellation. Overall, accurate pathologic study of renal specimens will become more crucial as minimally invasive surgery grows, and novel and alternative methods of determining surgical margin as well as biological behavior are necessary. and classification of carcinoma into both type and grade. 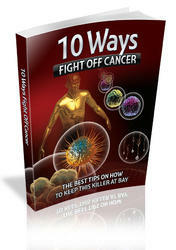 Moreover, in three cases of cancer (23%), cytology provided additional information compared to histology alone, including higher tumor grade and mixed pathology. Advantages of bag cytology include simplicity of specimen acquisition, standard technique of processing, and incorporation during assessment for perforation. Further investigation is required to assess whether the potential information provided by an additional test is useful and cost-effective.